The last stop was Seri Petaling. 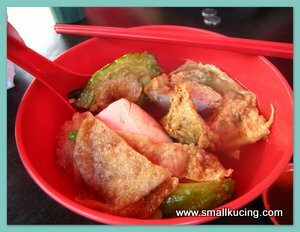 Mamarazzi ordered the famous Yong Tauhu from a stall there. RM0-90 a piece. Taste good and the soup is brew from pure fish bones. Papa felt like eating Char Keoy Teow. Fried by a "foreigner" but surprisingly the taste was quite good. Mamarazzi and me had Hokkien Mee. The Hokkien Mee by this stall have enough "Wok Hei" and ample crunchy pork lard. 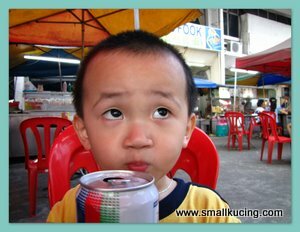 Anyway, the "Siew Chow" by this stall is normally taste good. Mamarazzi used to "tapau" from this stall previously. 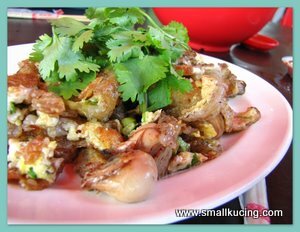 Papa wanted to have Fried Oyster so Mamarazzi went and order a small plate of RM7. Hmm...the eggs was quite crunchy. Not bad. Hmm...if only they would put more oyster into it then it would be wonderful. mmmm looks so delicious! late but happy new year! hokkien mee wow.. i love this meal hehe kalau campur prawns mars mell-o can finish the whole plate alone! The hawker stalls at Seri Petaling not bad one. I'm drooling over all the food there. Nah...not auntie Little Bird..it's Mamarazzi non-blogger friends in Seri Petaling and other places. Gotta send them their goodies before it's spoilt mah. Will do...memang gila Oh Chien and Asam laksa...will call you up to see where got good place to makan which only local know about. Hey, you sound like staying close to me and Alie Phua! 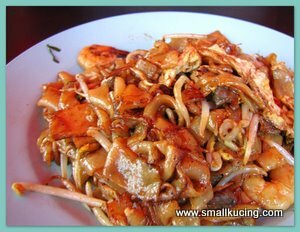 We are the regular of their Char Kuew Tiao, not bad hor?! 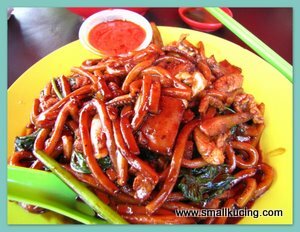 I love the Hokkien Mee which have enough wok hei! The colour looks good too! So much delicious food! Somemore near to my office. Will go and try them out during lunch one day..
Wah foreigner also picked up the skill of frying then in future our local people susah cari makan.